(c) 2019 Andolu Ajansi Provided by SyndiGate Media Inc. (Syndigate.info). This and these latest new Fox News moves could be the canary in the coal mine precursor to the destruction of the last fair and Conservative balanced source of truth for THE PEOPLE. With the 2019 May Fed Approved Disney acquisition of Fox News and Movies, the pantheon of Liberal Secular Socialist Progressive mind invasion just may have taken a giant leap forward. With Disney due to release their new live figure Aladdin movie, you can bet your falafels that anything and all things Anti-Arabic or Muslim will be Disney killed in the Cradle of American socially conquered and liberally bought up news. The silencing of Judge Jeanine Pirro’s truths and the hiring of the purple haired Donna Brazile now gone gray in “Fair and Balanced” disguise, is a prelude to a gay Progressive Disney inspired Conservative truth disaster. If real patriotic Americans CARE about truth, freedom and rights to think, they had better not trust or CAIR about placing an equal media footing to People who kill American journalists in Arabian embassies, and when acquire ultimate power through votes, soon have those voting rights disappear. Your comments were profoundly correct. We conservative Americans along with the help of POTUS, need to form our own truthful network and call it American Patriots Network. A lot of people do not want to listen to the lies the MSM put. We thought we were being told the truth by Fox but gradually they were being bought off. ALAS! Now it is going to be all untruths with no network to turn on and hear the truth. Maybe we could turn to Voice of America. It is a terrible situation for America and our Constitution is being threatened to the core! And, with the idiot child of Rupert Murdock taking charge of FoxNews, and Paul Ryan now a Director, don’t be surprised of Lachlan Murdock conforms to CAIR’s DEMANDS! IMO they already have.. What with their rabid and swift silencing of Judge Piro. If Fox caves on Pirro and Carlson, I will have a lot more free time in the evenings as I delete Fox News from my Cable remote. Someone should publish a list of any advertisers who drop Fox because of CAIR or any anti-conservative organization’s propaganda. There is a huge demand for conservative commentaries. If Fox caves to Donna Brazile and her democrat ilk, then Pirro and Carlson and O’Reilly and like minded others should create a new network, perhaps to be called the Conservative Patriot Network or CPN. I predict it would soar above Fox in the ratings and top the charts within their first month on the air! As i said the other day, i would Swiftly sign up to any cable provider that aired THAT channel! Me too! I am already changing the channel when Shephard, Cavuto and the rest of the skallywags are on! I really liked Judge Pirro and Tucker and Fox should think twice about trying to cancel these two, just because some “Scair” objects! This is OUR country and we will fight for it! I wonder, what the # of complaint calls they’ve had from us viewers, moaning about them censoring Pirro, has been?? You are right. I stopped watching anything Disney long ago unless it was the work of Walt Disney himself. Disney is buying Fox for the expressed purpose of destroying it. Ideology means more than profits to these people. 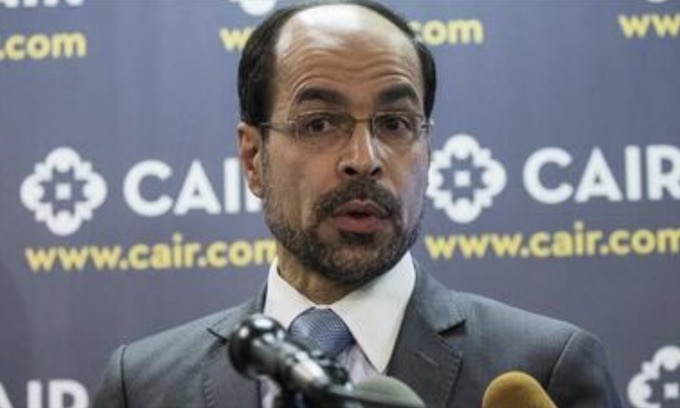 CAIR is the American PR arm of Hamas and the Muslim Brotherhood. The ties are easily traced and undeniable. They should be declared a terrorist organization and treated as such. Instead they are bestowed credibility by the utter stupidity of a large group of obviously confused Americans who felt compelled to elect to our congress two radical anti American Islamists who clearly have no place in our government. Thus emboldened organizations such as CAIR and race baiters like Louis Farrakhan feel free to spew hate and antisemitism and aggressively attack those like Tucker Carlson and Jeannine Pirro who have the courage to speak the truth. Sadly they are being silenced not by these mongrels but by our own Fox news. Call Fox now and tell them what you think… 888-369-4762. We need to clear up one thing. Fox News is NOT part of the Disney deal. Disney bought Fox entertainment properties. Its to the point, i really feel, once we kicked the germans and japs butts in WW2, we should have KEPT on kicking, and glassed the hell out of the entire mid east.. So we wouldn’t BE in this mess now. My Heart hurts, at the double standard brandished by the left, and all others who wish to punish our free speech, while spouting hate, racism, and racial bias abound in their own. With a name like Nihad Awad, who would expect anything other than pushing against our right to say anything about Muslims, while the likes of Ilhan Omar are able to distribute absolute, deplorable, disgusting, hate against Jewish People, and Americans, without the least bit of chastisement for her/their own rants. This is simply and quite obviously one more shot at shutting down, and silencing, FOX news. I do fear, with the degree of degradation, and teeter-tottering to the left, of FOX since the Children took the helm, it will completely implode at a given point, and the voice of the Conservative party, and it’s views, will be completely lost to it’s following. It is a disgrace that the left, their ilk, and fake news can openly display their hate of this President, all his followers, any opinions, and our free speech, while they, at will, spout all they want about us, and anyone else they choose. . If we do not take back the full Government, all branches, and get rid of all the RINO’s, in 2020, I fear we might never get back our freedoms again. We will be living under a big foot, rule, and Dictatorship of the extreme Socialized left, until and if, we ever get our heads out of where the sun don’t shine. MAGA. I agree, the Muslims are going to continue to push to the point where there are few options. The ones that should be fired from the USA are this guy. Pirro & Tucker speak the truth. It’s a WAR out there, not with guns, tanks and planes, but we are being destroyed from within. Our own Laws and Rights, Judges and the MEDIA are being used against us, and don’t forget the Democrats. They are not the media, they are the propaganda wing of the commucrats. Muslims do not CAIR about our country. Or have we forgotten their favorite chant: Death To America? A good rule of thumb would be to do the exact opposite of whatever these infidels are pushing. The religion of infinite wars with Christians. The religion of infinite war with Jews. The religion of infinite war with each other, when there aren’t any Christians or Jews to kill. The religion of calling war peace. The religion of the Jihad – nobody else uses this word. The religion of openly lying to advance their satanic cause. The religion of Obama deep-bowing to the Saudi royal family. The religion of slavery (even to this day). The religion of female genital mutilation. The religion of “honor killings”. The religion of astounding scientific achievement. Heh, just checking to see if you’re awake. Of course they haven’t invented squat in the last 1000 years. The religion of suicide bombers. The religion of perpetual offendedness. The religion of shaking with your left hand because they don’t use toilet paper. They have nothing good to offer. OK… so let me get this straight… The Judge and Carlson has …NEVER… lied about or distorted the TRUTH in anyway shape or form… just simply ask important questions that NEEDS to be answered so the public can make informed decisions on where the country is headed (God knows NO ONE else is) so we need to boycott them? Yep… keep it up … and wonder why the American public is developing a prejudice towards Muslims and the Regressive Liberal Socialist Democrats in general. When the Truth, is considered a revolutionary act…what you got? ggfithy, You do not understand/or wonder why the public has a prejudice? Well ggfithy, first it should not be called The Council on American-Islamic Relations (CAIR), but The Council on American-Islamic Reform. (CAIR). They do not, and if you read, listen to, or watch on international news, want to have good relations, but wish to reform the US into another Muslim Nation. Wanting a stronger 57 states of Islam. Listen to OMAR, in translation, when she is speaking to her fellow Muslims, or as I do read Al Jazeera. Also as far as Socialist Democrats, I am even more confused by your question. Just ask people from China, Viet Nam, Korea, Russia, Venezuela, or members of my Wife’s family from the old E. Germany about Socialism. I feel your problem is you listen to those who tell you what you want to hear, and not what you need to hear. I used to be a Democrat, but at the end of Jimmy Carter, I changed, and now wonder why it took so long. At 77 years old, I know you MUST look at all, and use your mind not those of other people with an agenda. My apologizes Sir… My post was a lame attempt at rhetorical/sarcasm. I’m fully aware of what damage that culture wants to do our existence. You laid it out very well… but you forgot one thing, they want to KILL …ALL.. Christians and Jews. For the record I listen to no one, do my own research and use my faith to guide me… Again.. My apologizes for not being more clear. Exactly GG. THe left, just wishes to silence and remove any/all opposition to the islamic take over..
Why should we even listen to these people. This is OUR country and not that of a few people who have a mouth piece. Let the truth be spoken. If we don’t stand up for our values we’ll be overtaken by those minorities from other countries. If they can’t assimilate and become true Americans, I suggest they go back where they came from. Remember or learn why women are forced to wear head scarfs. They are treated as second class citizens. For the life of me I don’t understand why women of this faith would want to continue to be viewed this way. They should stand up to their men and tell them enough is enough. We are quite tolerant in the USA, but that does not mean that we want to be overrun. Love the way we have it or leave. It is a privilege to live here, not a right. I am phobic in regard to these anti america anti semitic moslems and their constant spewing of hatred and threats. get out of my country. go back to your nest. and I do hope you take that personally. CAiR was indicted as a co conspirator with terrorist organizations. whatever happened to that investigation. everything this medieval savage cult comes anywhere near is destroyed. if fox caves to this censorship that’s it as far as my viewership. advertiser boycott. try it see what happens. see how your ratings are boycotted. I’m going with AON. feel free to join me. And start our OWN Counter boycot off EVERY COMPANY that supports CAIR< or bows down to their rabid demands..
Amen. These delusional people think that silencing differences of opinion will make a “better” society. No, CAIR hates America anyway and wants to further their goal of a world caliphate. I tolerate Muslims but there ideology has no place in our constitutional republic. Sorry but that is the truth. We are committing national suicide. Awwwww it looks like someone got their wittle itty bitty wennie stepped on, so the mazlamz now want to silence our right to free speech. Sell in that case they can just shut up and go away, the only thing they want to push is no good rotten sheiaria crap that they keep spewing on about. The mudslimes should NEVER have been put in office MOT at all they do not deserve to be in this country. A law was passed and duly signed back in 1953 I called the Walter-McCarran act, which states that people from other countries are NOT allowed to come here if their purpose is to subvert the CONSTITUTION and try to take over the country, well if that is not what the mudslime are doing then they need to be removed at once, they are in FACT trying to take over and destroy western civilization, and convert it to something from the middle ages. I do not bow down to anyone, muslim, jew, Christian, democrat or Republican. Cair can drop dead. I do not like them and consider them enemies of my country. If my country will not defend our citizens against attacks, then give letters of marquee to citizens. Let us take the fight to the enemy. Very well said! I agree with you. Sincerely hope that it doesn’t come to this but I never imagined that the Left would ever get this crazy. As we often say around here, JUST when you thought the left couldn’t become any crazier, we keep getting proven wrong! As the radicles push us closer & closer to civil war the businesses in this free republic bend over backwards for the radicles…why? In the long run it will be bad for business! So for telling the truth, they get silenced? And CAIR has the audacity to declare that anyone speaking against Islam and its known tenets is to be castigated? Are all Muslims now claiming that they, just like Muhammed, must not be spoken against, even if what is being said is the truth? Fox News, how gullible can you be? And how cowardly of you to allow this to happen. I, and hopefully most other Americans, am ashamed of you! Yup. THAT is exactly how mudslimes are. SILENCE any dissent. Shut down any opposing views of islam. AS THEY SLOWLY and surely take over. I see, Muslims can kill others, but others can not speak bad of Muslims! Hm, seams fair to me! Screw CAIR! Pity everyone else will also be paying that price. Cair is considered a terrorist organization by some countries, their ties to hamas and the muslim brotherhood are documented by the FBI. Why does our media pay any attention to them to start with, the media should not give them a platform to even speak, let alone, give into any demands, it is foolish. Denying these people (Fox Hosts) their right to free speech based on a group that will not even denounce hatred, murder and numerous other assaults against all people is ridiculous. Maybe it’s time to tell the folks at CAIR to go to someplace they profess doesn’t exist. This is a CHRISTIAN nation, if you can’t accept criticism you shouldn’t be in a position to be criticized and god knows you leave too many opportunities for people to be critical of your representatives and their adherence to some of the doctrines of sharia law that is not the law in the United States. I don’t WANT any Muslim input into my life. Period ZERO, None Nada. I don’t want muslims anywhere in my life. PERIOD. I want it eradicated from the face of this planet. CAIR shouldn’t be allowed in this country but all the blind Dems will be good little things and follow this terrorist’s instructions which will lead to more infringements. Fox will obey too and will be known as the CAIR Network. I’ve got a MUCH better idea, let’s run c.a.i.r. OUT of OUR Country on a rail, tarred and feathered! Take their muslime ***** and kick it totally OUT of America, PERIOD! AND all their mudslime apologists, right along with them! Shut us up and we let them do it. There is no such thing as islamophobia. It’s a made up word. CAIR is a terrorist organization and promote anti-American ideas. Islam is a plague on Humanity. Why is it that these people who are, in reality, hostile to the USA, demand that we, or any other American, apologize to THEM for our opinions? CAIR has been connected to, and supportive of financially, several named organizations, past and present, hostile to the USA. How about THEY come clean, admit it, and apologize to US for supporting them (openly or clandestinely), and their shenanigans? It is and has been an openly stated goal over decades for radical Muslims in this country to convert it to a secular Islamic state. This is antithetical to our freedoms, laws and Constitution. If they do not like this country as it stands, with all of its flaws, well, don’t let the door hit you on the way out. Because it has been in the works for years…its the grand design! They have infiltrated our country and multiplied exponentially as well as in Europe! They are trying to end Christianity as we know it…Had we never elected Obama, we may have had a chance, but we were stupid and thought he was the way…but sadly we were wrong…it may be too late to reverse the damage but I for one will die fighting these evil doers and will fight to save my granddaughter from Sharia law!! We are slowly losing ALL of our constitutional rights and liberties. All that is going on right now, was warned long ago! We didn’t listen! When Obama ran the first time, the warnings were reiterated and we still didn’t listen…are YOU listening now? We have allowed hateful evil doers to infiltrate our homeland to disrupt, murder and basically bring Christianity to extinction. If they silence us, we are done! People need to wake up and realize that before it is too late…It is time we grew a spine as a nation and send ALL of them packing…we have been generous and accommodating to them and this is what we get..NO MORE! NO MORE OPEN BORDERS, NO MORE COWTOWING to the hate mongers who’s agenda is to take over OUR country…I stand with TUCKER, Jeanine and anybody else that has the balls to stand up to oppression…I will work hard to share the word and to end FOX if they do not stand up themselves!!! Wonder what CAIR would do if they were aware of what Pres. el Sisi said to imams more then four years ago? Egyptian President Abdel Fattah el-Sisi spoke out against Islamic extremism on New Year’s Day, which coincided with the birthday of the Prophet Muhammad. On Tuesday, the President visited the main Coptic cathedral in Cairo to attend a Christmas mass and make a short speech. He is the first president to attend such a mass since the revolution. “We will build our country together. We will accommodate each other. We will love each other,” el-Sisi said in that speech. Revolutions in deed and in thought have characterized Egypt, And President el Sisi’s “revolutionary” call for imams to reject Islamic extremism [ though still largely ignored (insofar as we can tell) ] is cause for optimism: It’s an essential but not sufficient element in a recipe for restoring Islam’s good name, everywhere! Another contrarian here, I therefore voted ONE star, wish I could negate the whole thing. Too bad he had to ruin an otherwise good post by injecting that foolish opinion of pislam’s “good name”. Islam to my knowledge, never has had a good name.. ANYWHERE. Pity the dems love of the mudslimes, is not ruining THEM only..
CAIR should not be allowed in the USA. They have no use for this great country and are have one basic goal. Destroy this nation period. Wake up America it’s time to take a stand against those that want only to destroy our great land. May the God of the Bible continue to bless this great land and protect her from her enemies.such as CAIR. In America we have THE RIGHT OF FREE SPEECH!! WE DEMAND Judge Jeanine be reinstated and DON’T EVEN THINK ABOUT FIRING TUCKER CARLSON!! It hurts the liberals to hear the truth!! Obey the 1952 Immigration Act that forbids muslimes in America!! Time for another Crusades 2.0!! More and more it appears, those rights are ONLY For muslims and their apologists..
And all who support them, should be branded as traitors. Tucker Carlson and Jeanine Pirro MUST be left alone to report on the truth. If it was defamation/slander/libel, Pirro would win a suit like that because she speaks the truth and did not slander or libel anyone. If FOX News cans her, she should sue them with a massive wrongful discharge lawsuit for slander, humiliation, infliction of emotional distress, outrage, etc. $200,000,000 in damages would not be enough for Constitutional Rights violations. She should also make CAIR a Defendant and their board members/agents in such a lawsuit also. I am an American. No hyphen after that. No separate but equal status claimed. America should be for Americans, not a beachhead for the enemies from other countries.